Today I am going to share a very simple and effective tip to help you win more matches. Have you ever talked to yourself negatively on court? For example, after hitting a ball to the net, you say something like, " Oh man, not again!" or " Come on, why do I always hit to the net!" Here's what you are going to do whenever you talk to yourself negatively. You are going to get a rubber band and put it around your wrist. Every time you have a negative thought on the court, you are going to pull on that rubber band and gently snap yourself. Immediately, I want you to replace that negative thought with a positive thought. So if you have those negatively statements that I mentioned earlier, I want you to gently pull on that rubber band and say something like... "It's ok, you can make the next one. Aim a little higher on the next shot." 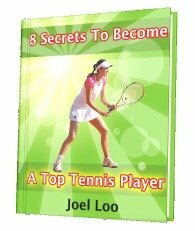 Just making this one simple shift can totally transform your tennis. And the cool thing is that is is FREE. You don't have to hire a sports psychologist to "SAVE" you from your mental roadblocks. Becoming AWARE of your thoughts is one of the best things you can ever do to help yourself. If you are going to participate in any upcoming tournaments, please use this rubber band tip, and send me your awesome results. You will compete better and have more fun learning about your game. This website is for informational purposes only and does not provide individual advice. Use the information on this site at your own risk. What are you waiting for? Fill up the form and grab your FREE Report.